Several GOP senators introduced a new bill to protect people with pre-existing conditions yesterday, including several senators who are up for re-election next year. What's new: The bill is an enhanced version of one introduced by Sen. Thom Tillis (R-N.C.) last year; unlike last year's, it requires insurance companies to cover treatment of an enrollee's pre-existing conditions. Details: Both bills require insurers to cover people with pre-existing conditions and prohibit them from charging sick people higher premiums. My thought bubble: This bill is a reminder of the awkward politics Republicans find themselves facing on health care. While the DOJ is arguing that the entire Affordable Care Act — including its pre-existing conditions protections — should be struck down, the party knows that these protections have become popular with voters. Go deeper ... Trump flips: For now, GOP is no longer the "party of health care"
Trump flips: For now, GOP is no longer the "party of health care"
GOP leaders are trying their best to put a lid on President Trump's talk of a new and wonderful health care plan that would define the Republican Party for 2020. 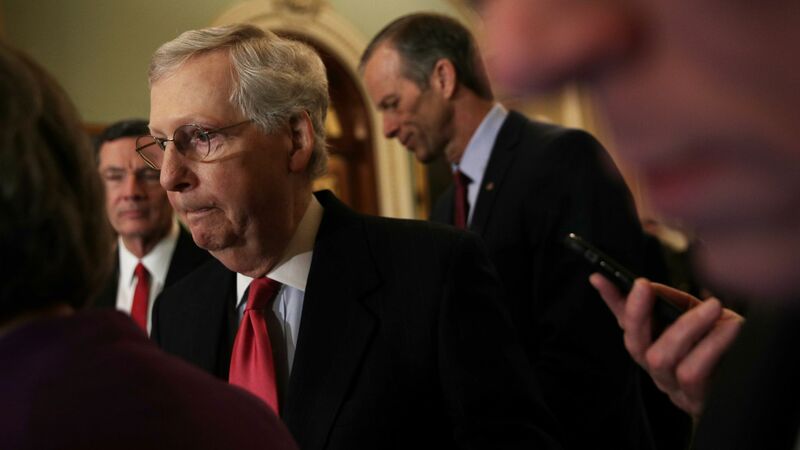 Driving the news: "Not any longer," Senate Majority Leader Mitch McConnell said yesterday when asked whether he and Trump differ on health care. McConnell said he spoke to Trump Monday and "made it clear to him that we were not going to be doing that in the Senate." RNC Chair Ronna McDaniel and Trump campaign manager Brad Parscale also "tried to tell the president they could not understand what he was doing," The New York Times reports. "I wanted to delay it myself," Trump said in the Oval Office yesterday, denying that McConnell forced his hand. "I want to put it after the election, because we don't have the House." Reality check: It's still the Justice Department's position that the courts should strike down the Affordable Care Act. As long as this lawsuit is still active — and that will be a while — it'll be accurate for Democrats to say on the campaign trail that Trump is trying to end protections for pre-existing conditions. In the short term, Trump's rhetorical punt to 2021 may dampen the intensity of questions about how Republicans would rebuild a new system for individual coverage — questions the party has struggled to answer for the past 9 years.